Here is a list of best free HDR software for Windows. These software let you add HDR effect to images by changing various image properties. HDR stands for High Dynamic Range Imaging. It is an old practice of photography to make a picture look good and vibrant. It is a technique which enhances color range, brightness, sharpness, and shadow of a standard photo and adds more dynamic ranges. There are two ways to create an HDR image. The first method lets you enhance a single image by adding various effects to it. The second method makes use of multiple shots of a single frame shot in different exposures (under, normal, and over). Nowadays, HDR mode comes built in with cameras and mobile phones, but you might need more dynamic detailing in your photos. I have tried to find the best free HDR software to add HDR effect to a single picture and merge multiple shots to form a HDR image. Go through the article to know more about these tools. Here you will also learn how to create an HDR image and how to merge multiple photos to HDR. My favorite HDR image processing software is AutoHDR Free. It can merge multiple images to an HDR image. You can also modify color range, contrast, details, highlights, sharpness, shadow, etc. to get desired result. Various presets are available which can be used to easily apply HDR effect on images. You can also add watermark to an HDR image and output can be saved in various image file formats. You can also check these List of Best Free Mosaic Maker Software For Windows, Best Free Image Compressor Software For Windows, and Best Free Employee Management Software For Windows. AutoHDR Free is a free HDR software that can be used to process HDR files and create HDR images from multiple images. The features available let you align and merge images and process them as HDR image. The alignment tool comes in handy when you click multiple shots of a same frame and they go out of alignment. There are various processing options which let you add and modify details, contrast, color, noise, shadows, highlights, and sharpness. There are some preset HDR filters available, which can be directly applied to an image, like: Sharp, Very sharp, Architecture, Landscape, Macro, People, Transport, Wildlife, Artistic, Black and white, Bold, Detailed, Natural, Timed, etc. You can also create your own presets that can be easily accessed. Another option lets you enable safe smoothing at various levels: Soft, Normal, Strong, Stronger, or none. This HDR software adds a default watermark, which can be disabled or you can add your own watermark under Advanced options. The output image can be saved as JPG, PNG, GIF, or TIFF in this HDR software. Luminance HDR is an open source HDR software. It lets you make HDR images using HDR Creation Wizard. You can add multiple images of same frame to merge and then change different properties, like: alignment, image exposure, anti-ghosting, etc. The options available for alignment are Auto align images, Hugin’s align_image_stack, MTB, and Auto-crop. Use Tonemap operators and change the properties associated with them. Some of the Tonemap operators are Mantiuk ’06, Mantiuk ’08, Fattal, Drago, Durand, Reinhard ’03, Reinhard ’05, Ashikhmin, and Pattanaik. Based on the Tonemap you choose, you can adjust a bunch of image properties. This includes Contrast factor, Saturation factor, Detail factor, Contrast equalization, Color saturation, Contrast enhancement, Luminance level, Alpha, Beta, Noise reduction, Bias, Base contrast, range, Lower scale, Upper scale, Brightness, Chromatic adaption, Light adaption, Equation number, Auto cone/rod, Rod level, etc. Options to adjust levels and set white balance for HDR images are available as well. Transformation options to rotate, crop, and resize images are also available. This HDR software with extensive features also lets you batch process HDR images, copy EXIF data, perform batch tone mapping, and import FITS files. This freeware to make HDR can open and process the following image formats: JPEG, TIFF, KDC, DCR, PEF, SRW, TKV, CR2, NEF, DNG, VDN, MRW, OFF, CLF, ANV, RAF, REFV, PTX, RAW, SR2, RW2, 3FR, MEF, MEFV, MCR, MCS, EIF, NRVV, etc. After processing HDR, image can be saved as EXR, HDR, PIC, TIFF, or PFS. Picturenaut is another good HDR software that can be used to create HDR images from single or multiple images. HDR display options let you change the exposure, gamma, and offset values of an image. You can carry out exposure correction, ghost removal, automatic image alignment, and color balancing on a set of images to merge. Add Weight to an image with standard or mid emphasis. Manage Image Curve to manipulate linear, compute, standard, or user defined curve. Grayscale or RGB-color mode can be chosen and color density can be changed to either 8 Bit, 16 Bit, or 32 Bit per channel. Transform your images using pan, zoom, rotate, flip and resize options. You can create HDR images with DNG, CRW, CR2, MOS, RAF, 3FR, DCR, KDC, K25, PXN, MEF, MRW, NEF, ORF, RAW, PEF, X3F, SRF, SR2, ARW, TGA, VDA, ICB, VST, JPEG, PNG, TIFF, and PPM files. Save your HDR image in TIFF, EXR, HDR, PIC, or PFM formats. FDRTools Basic is another free HDR software for Windows. Add multiple images capturing same frame, but at different exposures to make HDR photo. 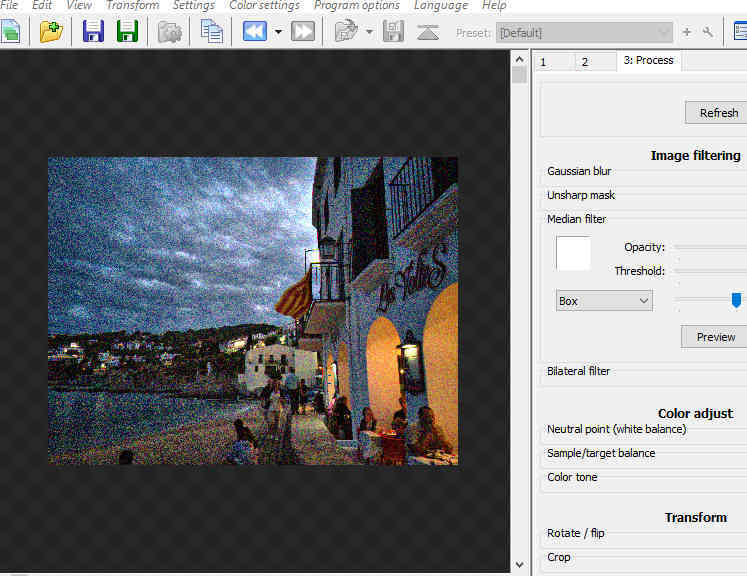 You can include any number of pictures and select options to align images and create HDR image by Tone Mapping. For alignment, you can select from horizontal or vertical shift options, and you can also select an image to be included for alignment reference. A window shows the preview of the changes at all times in various modes, like: Zoom, 360 Panorama, Zenith, and Nadir. There are 3 HDR creating modes: Average, Separation, and Creative. For White Balance Reference, an image can be chosen from from the set of images. Image Exposure and color options can be changed as well. Various preset curves are also available to apply on pictures: Constant, Triangle1, Triangle2, or Triangle3. This software to make HDR images takes each pixel from one source image, and you can use separation sliders to separate pixels by intensity. There are various other HDR parameters that can be changed to achieve desired result. You will also find general image editing options here, which can be found in any simple image editor. You can create HDR images from JPEG, TIFF, HDR, RGBE, OpenEXR (EXR), and DCRAW (3FR, ARW, CRW, CR2, CS1, DCR, DNG, ERF, IIQ, K25, KDC, MEF, MRW, NEF, NRW, ORF, PEF, RAF, RAW, RW2, RWL, SRF, SR2, SRW) files. HDR images can be saved as HDR, RGBE, EXR, TIFF, PNG, PPM, BMP, and JPEG. Create HDR photos for free with Machinery HDR. This freeware makes HDR images out of a single image file. It adds HDR effects by varying the range of saturation, RGB color, color scheme, etc. It lets you batch edit HDR images. It has a builtin app called Machinery Explorer, which lets you find image files to add for HDR processing pretty easily. Adjust parameters for Micro-contrast, Details, and Dynamic contrast for detailed images. This HDR software also lets you compare the processed image to original one. It supports various image Formats, like: JPG, BMP, TIFF, PNG, DNG, CRW, CR2, RAW, NEF, and other RAW formats. easyHDR BASIC is one of the best HDR software. Here you can make HDR from single image or multiple shots of the same image. In order to enhance your image, you can Adjust colors, Apply filters, Adjust HDR strength, and Control softness. You can apply HDR noise filter as well as change image tone by controlling gamma, sharpness, saturation, compression, micro, shadow, range, etc. Rotate and flip an image in different direction if required. This free HDR software is a pretty impressive tool to create an HDR images, but there are some features that it lacks, such as: Batch processing, Ghost removal, etc. It can open Raw and JPEG image formats and save as JPEG, TIFF, and BMP file formats. P.S. : easyHDR Basic is a free version of easyHDR software, which is a paid one. There are various advanced features that can be found in the paid version. Visit the website to know more. GIMP is an open source image manipulation freeware, which is the most popular Photoshop alternative out there. Not many people know that it can be used to create HDR images as well. There is not any direct option or special feature to apply HDR effect, but you still can create an HDR image either by using Photoshop HDR plugins, such as Photomatix or by following a series of steps. Although plugins give satisfactory results when you apply HDR effect, you can use manual process to get similar or better result. This process includes darkening and over exposing the original photo separately, then adding these three photos as different layers in a single tab. By adjusting opacity and other parameters of these layers, HDR effect can be achieved. You can use the same process to apply HDR effects to photos using other image editing software, such as: Paint.NET. Fusion F.3 is a free version of Fusion HDR software. You can process a single image to add HDR effect, but it works extremely well if you add multiple exposure shots of the same scene to process HDR. It auto aligns pictures in case they are out of alignment. 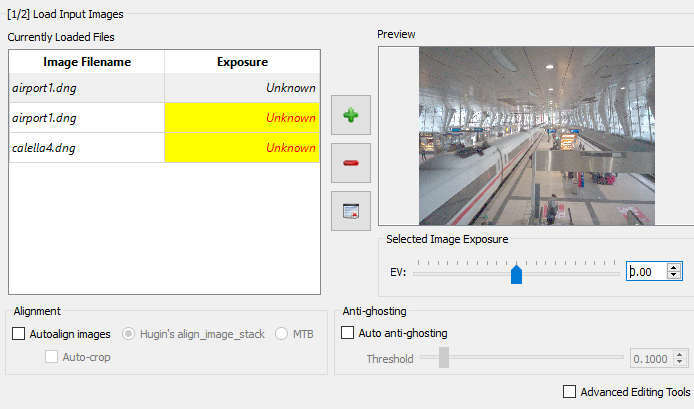 Summation and HDR operator tools are available, which let you post process images after HDR merge. In the free mode, you can use only one processing mode out of the various options available. These modes let you control threshold, smoothing, compression, detail contrast, shade, middle, light, histogram bounds, left shade, contrast, color saturation, color temperature, tone splitting, sharpness, exposure, exposure center, radius, etc. The paid version lets you batch process HDR images by applying the same settings to multiple image sets, but that is not enabled in the free version. You cannot save the final result in any image format other than JPEG. You can open and process RAW, JPEG, TIFF, and BMP images with this free HDR software.